UPDATED: Mon., Feb. 26, 2018, 10:47 p.m.
After months of questioning the wisdom of various policies proposed by President Donald Trump from afar, Washington Gov. Jay Inslee got a chance Monday to do it in person on what may be the nation’s hottest topic: guns. 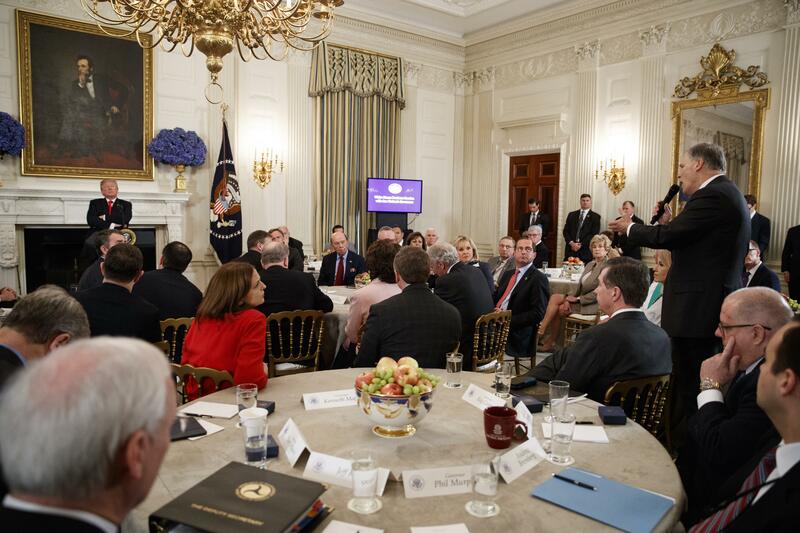 During a Washington, D.C., meeting between Trump and the National Governor’s Association, Inslee pointedly criticized the president’s suggestion that one possible solution to school mass shootings would be armed teachers. “I know that you have suggested arming our teachers,” Inslee, a Democrat, began. Not all teachers, Trump broke in, but a small percentage. Enough to provide “major retaliation” if a gunman goes into a school. “A very small group of people that are very gun adept,” the Republican president explained. Whatever percentage it is, Inslee said he was against it as both a grandfather and Washington’s governor. Law enforcement agencies have also told him they don’t want to train teachers through a program that takes about six months. “I just think this is a stance where we need to listen, that educators should educate and they should not be foisted upon this responsibility of packing heat in first-grade classes,” Inslee said. He suggested that government leaders to “a little more listening and a little less tweeting” and get away from the idea of arming teachers. Trump stood with arms crossed while Inslee spoke, then didn’t respond directly. He called on Texas Gov. Greg Abbott, a fellow Republican, to explain a program that trains teachers and coaches to carry firearms in that state. Some schools even post signs that say there armed personnel inside. He later said schools should give a $1,000 bonus to teachers and coaches willing to go through the training, and possibly have 50 or 60 armed staff in the school, which would be better than $50,000 to $60,000 for one security officer. Inslee has pushed the Legislature to pass gun control bills that would restrict access to semi-automatic military-style rifles to buyers 21 and older and to require the same level of background checks required for handguns. Shawn Vestal: Inslee can stand up to Trump, but can he stand up to the Legislature? Previous attempts to restrict so-called assault weapons in recent years have stalled. But a bill just introduced Friday includes those provisions, as well as a requirement that the state develop a “Students Protecting Students” program with a communications center that would allow students and members of the community to relay anonymous reports of potential harmful activities or threats to law enforcement. It is scheduled for a special hearing this morning in the Senate Ways and Means Committee. The final version of another bill that would ban bump stocks, a device that can make a semi-automatic rifle fire nearly as fast as an automatic weapon, is expected to be approved by the Senate and sent to Inslee later this week. Published: Feb. 26, 2018, 7:18 p.m. Updated: Feb. 26, 2018, 10:47 p.m.